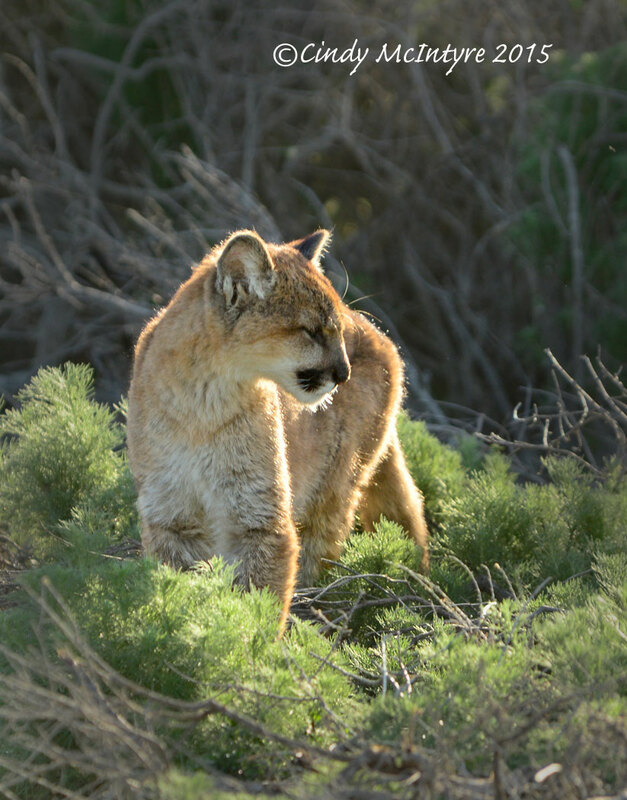 I’ve worked at several national parks that had mountain lions, and try as I might, I never saw one. Until yesterday at Montana de Oro State Park near Morro Bay, California. 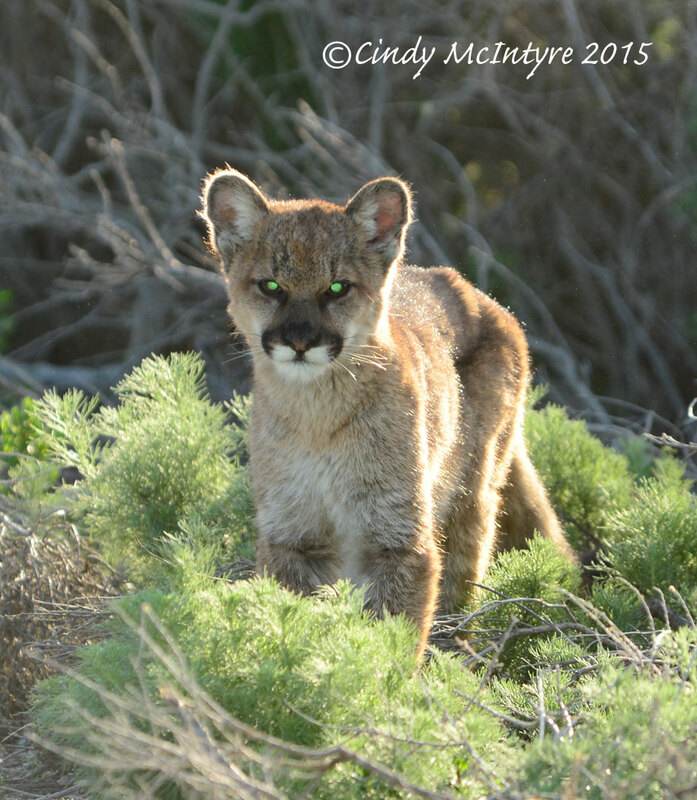 This young cat had been seen a few minutes earlier by a jogger and some hikers who told me to look out for it. I had my camera locked and loaded, visualizing the hoped-for encounter. 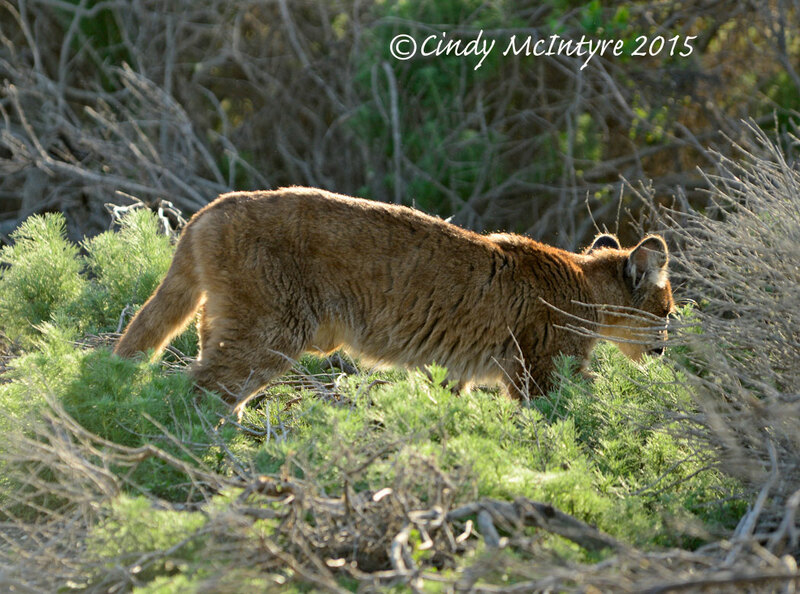 When I heard a slight rustling in the shrubs alongside the trail, I stopped. And then he appeared! He sat right in front of me, blinking, as if he had been expecting me. Then he figured he’d done his duty and returned to his nap spot. He seemed large enough not to need his mother, which would have made me extremely nervous knowing she might pounce at any minute. From the side, he (or she) looks like an oversized orange tabby cat. The lead photo has been retouched to remove the green glow that you normally see at night when a flash is used. Oddly, the young lion’s pupils were apparently fairly wide open when he stepped into the bright sunlight, even though the sun was behind him. If he had been napping, that would account for the dilated pupils, which allowed the sun to bounce to the back of the retina and reflect green. I did not use a flash, so this was a very odd thing to see. I just replaced the green glow with black and added a highlight in each eye to make it look as normal as possible. I wish this young cat well. I hope he learns to stay away from cars and people, and finds plenty of deer and squirrels to fill his belly. Update April 20, 2015 – this cub apparently had a vision disability and the following day had fallen over a cliff onto the beach. It was rescued, but several weeks later had to be euthanized due to the severity of the disability. It’s with a heavy heart that we report the young mountain lion kitten rescued a few weeks ago has been humanely euthanized. This decision was made after much research and consultation with many respected wildlife experts. While the cat initially seemed to perk up after receiving care from CDFW’s Wildlife Investigations Lab in Rancho Cordova, it was obvious that it was still struggling to remain healthy. The specialists at UC Davis also confirmed that its condition was not treatable. Domestic cats with retinal degeneration can develop additional eye problems. The risk of continued change to the eyes, which could be very painful, was a big concern. Treatment and daily care would be a significant challenge for even for the most skilled wildlife facilities. The other long-term concern was the cat’s quality of life. For it to remain healthy in captivity, it would need to run, jump, play and bond with members of its own species, which would have been difficult at best. 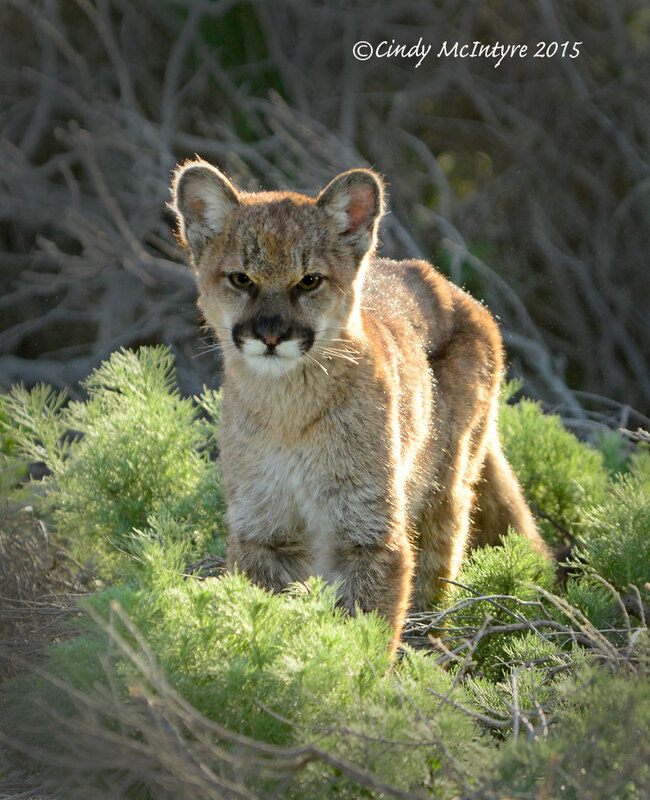 The mountain lion was necropsied at the UC Davis California Animal Health and Food Safety (CAHFS) lab by an experienced wildlife pathologist with consultation from eye pathology specialists to learn as much as possible about what happened to it. In the end, the cat’s overall welfare and projected quality of life were the most important factors in making this decision. CDFW would like to thank Dr. Deana Clifford and her staff, as well as UC Davis, for their expertise, time and care during the last few weeks. These photographs can be purchased here.